As a favourite eco-friendly mode of transportation, the 2017 Toyota Prius can get you there with more than just fuel efficiency. While the MPG rating for this car is certainly impressive, you also get advanced onboard technologies, a practical interior, excellent safety and legendary Toyota reliability. Toyota makes six practical models, so you can easily choose the Toyota Prius which works best for your lifestyle. No matter which version of the Toyota Prius you select, the standard powertrain includes a 1.8-liter four-cylinder engine, which uses variable valve timing with intelligence. The result is a peak 95 horsepower, plus 105 lb.-ft. of torque. Mated to that is a permanent magnet AC synchronous electric motor. It's rated at 71 horsepower and 120 lb.-ft. of torque. Net output for the entire hybrid powertrain is a solid 121 horsepower. Everything is routed through an electronically controlled continuously variable transmission (E-CVT). In addition, you get a 201.6V sealed nickel-metal hydride battery for powering the electric motor. While the Toyota Prius certainly is geared toward efficient driving, you also enjoy tight handling. The front-wheel drive is complemented by and independent MacPherson strut front suspension, plus a double-wishbone configuration for the rear. Stabilizer bars in the front and rear help reduce body roll, so you can take corners with confidence. The electric power steering and four-wheel disc brakes add to your sense of control at all times. With a solid reputation for safety, it's no wonder the Toyota Prius can be had with a comprehensive array of active and passive designs. One prime example is the available blind spot monitor, which warns drivers using a light on the side mirror if another vehicle is out of view in the next lane. Rear cross-traffic alert also detects other cars you can't see, but uses an audible warning to get your attention. All models come with an integrated backup camera. It switches on whenever you shift into reverse gear, helping you to avoid hitting obstacles while backing up. Also included on all versions of the Toyota Prius is the Star Safety System. It bundles together six vital active safety technologies: Smart Stop Technology, antilock brakes, brake assist, electronic brake force distribution, traction control and vehicle stability control. You can also get rain-sensing windshield wipers. Whenever moisture hits the windshield, they spring into action, even adjusting to the speed of your car. Everyone will love the Toyota Prius interior, because it's designed to comfortably accommodate up to five people at once. You also enjoy a spacious rear cargo area, with the convenient hatch for loading and unloading larger items. What's more, drivers use a sleek dash that features a standard 4.2-inch color information center screen. You can add a 7-inch touchscreen to the center stack, plus a Qi-compatible charging pad for devices. Quite a few amenities can be added to the car, making the interior even more enjoyable. The moonroof lets in additional light, plus with the touch of a button introduces more fresh air. Leather upholstery, power-adjustable seats and built-in heaters are also available. 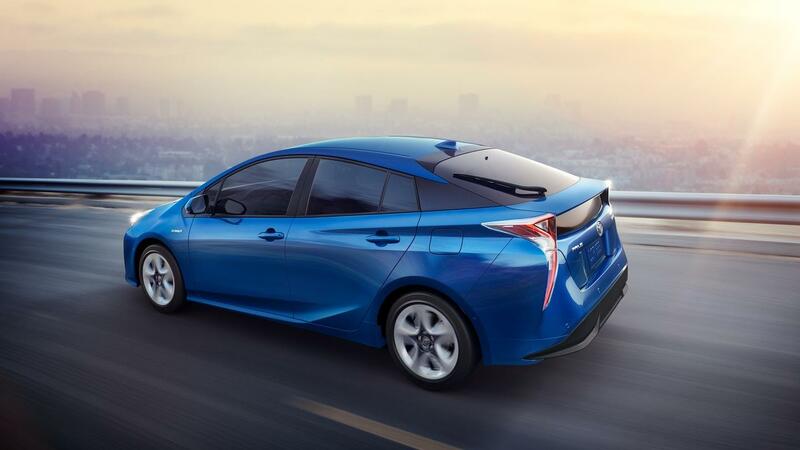 There's so much more to the Toyota Prius, which you can learn about by visiting our dealership.